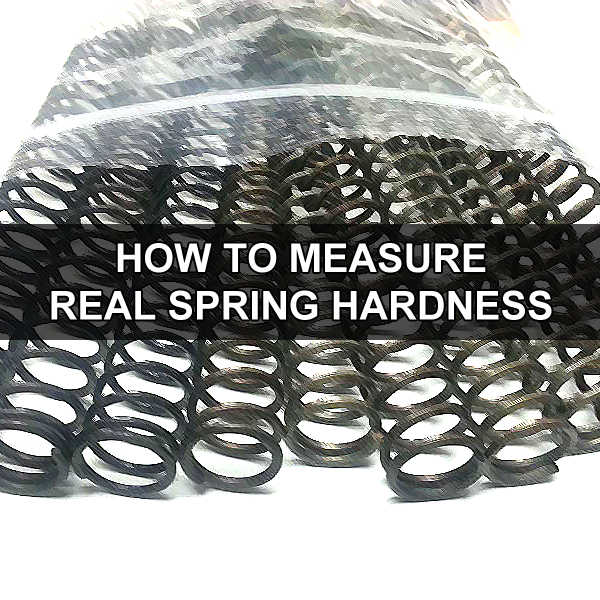 How to measure real hardness of airsoft springs? Surely you have heard story how from weak airsoft spring someone got extremely high power. But where is a truth? Look at it with us. Spring is basically the main upgrade part which assist in increasing power/energy of airsoft gun. Their marking is different by specific manufacturers and destination. Signing most often begin with letters M and SP. As a general rule is that the digits after letter indicates the theoretical muzzle velocity which is specified in m/s. For example with spring M120 (of course - for correctly assambled weapon) should be able to reach the muzzle velocity of 120 m/s. Sometimes the spring hardness is indicated by a percentage. The digits in this case means by how many percent is spring stronger than basic spring. In general we can say that marking by a percentage is very confusing and complicated. The important but often forgotten factor is real spring hardness. Please know that there is no standard or generally respected norm. Due to this reason a lot of spring manufacturers make products, where is possible to measure real hardness of spring one or two levels more harder, than is signed on label package. Logically this may cause problems for guns where the configuration of inner parts is fitted for a some working condition. Using of unsuitable spring have negative effect on all components and this lead to higher and faster damage. In our service workshop we measure the real hardness of each spring what are installed to guns. We follow the range of spring hardness from Systema brand, which were on the market first and therefore in our opinion they defined first standard. These springs achieve the realistic power and labels on packaging corresponded with this standard for example: spring with sign M120 = 120 m/s, M150 = 150 m/s etc. It absolutely does not make sense to play the game like: "I have gun with spring M120 but the power of my gun is 145 m/s! Hey I am a great man." or on the other side "My gun has limit for my country, because I have M120 spring only! I don't understand, why your chrono say that my muzzle velocity is 145 m/s.". Surely you have heard from someone that some brands of springs are better than others and guns with them achieve greater power. Again this does not make sense, because it is always about comparison of the wire diameter, material, method of winding and number of turns. It is simple, it is not possible to get something more from a spring. This is reason why real hardness is more important than sign on label from producer. Also keep in mind that each spring, sooner or later, will weaken and stabilise at a lower power - mainly stronger types. Also is not clever to buy an expensive spring, because they will be "tired" after similar period as cheaper springs. It is better to replace weaken spring once per every two years for a new one. How to measure real hardness? According to the following instructions you can make measuring device by yourself and find out the real spring hardness. You will made a Newtonmeter for compression springs. Description: to plate of thickness 7.2 cm you have to drill a vertical hole for inserting the measuring rod (weight of rod - 130g). Rod has a scale along its length to determine hardness. At the top of the measuring rod is bolt, which will compress the spring. On the bottom side of the rod is weight of 6.5 kg. 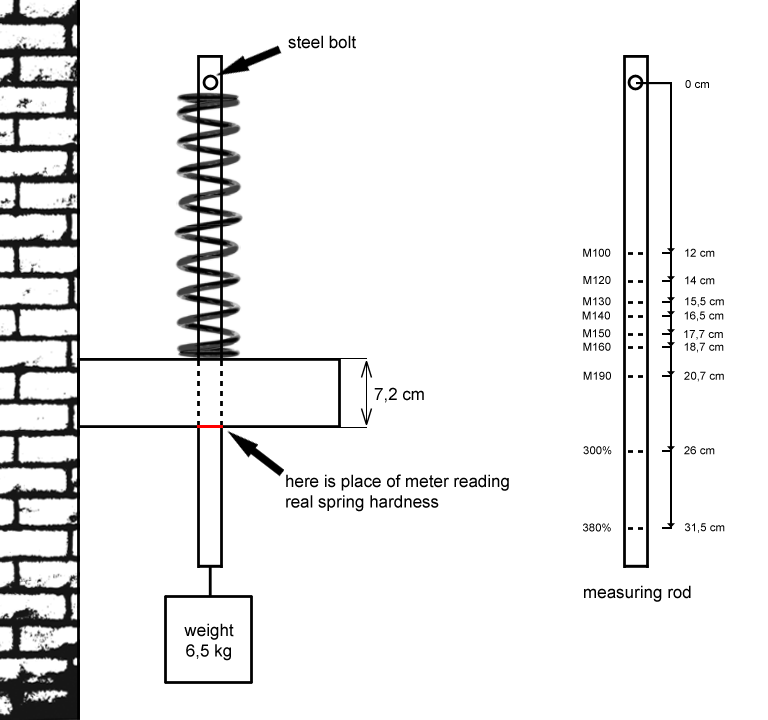 Spring is compressed after inserting between the bolt and plate. The real hardness of spring you can read under the plate at the point indicated in the picture. This meter for measure of real hardness of airsoft springs we use in our service workshop for more than 10 years. It's useful device when we are upgrading and repairing every airsoft guns because techniques can measure the real hardness. They can better choose configuration of upgrade parts (turning ratio of gears set, speed of motor and battery voltage). After gun is assembled we measure muzzle velocity. In this moment is possible to determine if final power agrees with the real hardness of spring. The technician simply determines if somewhere escape air pressure, something go wrong or if he make good job and got 15 m/s (50 fps) over the real spring hardness.